This week I attended the 3rd Annual Kids’ & Family Tech Expo, hosted by Child’s Play Communications, to see the latest tech products designed for kids and parents. This year I focused my search on products that combined technology with being hands on in some way. Here are a few products that caught my attention. Note: I was invited as media to the event. However any personal views expressed are always 100% my own. The Virtuali-Tee is an Augmented Reality T-Shirt. 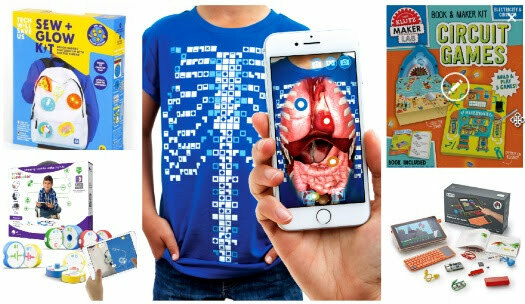 Use the free app (on iOS & Android) on the 100% cotton tee and watch it bring the Science of Anatomy to life. With augmented reality and amazing 3D learning experiences you can explore the circulatory, respiratory and digestive systems in fully immersive 360 videos. The Virtuali-Tee’s brand new heart rate tracker is a completely new way to connect you to your body. The app measures your heart rate and allows you to visualise your heart rate beating live in AR! Available in Youth XS to Adult XXL. Works with selfie mode and goes in the washing machine! Get ready to be amazed with this electrifying combination of five circuit games to build from scratch. Use actual electronic components to construct a DIY operation game, compete with friends in a Space Loop race, assemble a quiz show board, and more. A step-by-step book of instructions teaches you how to be a maker by adding wires, LEDs, and buzzers for super-charged fun. Learn to build 10 LEGO® machines, then experiment to create a chain reaction. With a handful of basic bricks from your LEGO® collection, the only thing you’ll need is a little imagination. Sew + Glow: Sewing badges. Making circuits. Playing with Power. Use included templates or make your own to create light-up badges with flashy electro thread. Includes disappearing ink pen. Templates in the box with dozens more online. Plus with the free online MAKE platform, there are dozens of projects to make! Build circuits with the Circuit blocks and interactive tutorials in the circuit conductor app. Scan your circuits to learn about the roles electricity, magnets, and currents play in the circuits you build! The app will show you the electrical current in your circuit with Augmented Reality technology! Use your imagination and problem-solving skills to create and experiment with your own circuits! Computer Kit Touch is the most advanced DIY computer that is a complete system for learning to code, with touchscreen, keyboard, creative tools, and hundreds of projects. Build a portable, touchscreen computer, and attach a keyboard, following a simple storybook.